Coming home on New Year's Day, I decided to pull a card and just see what ideas it set off. 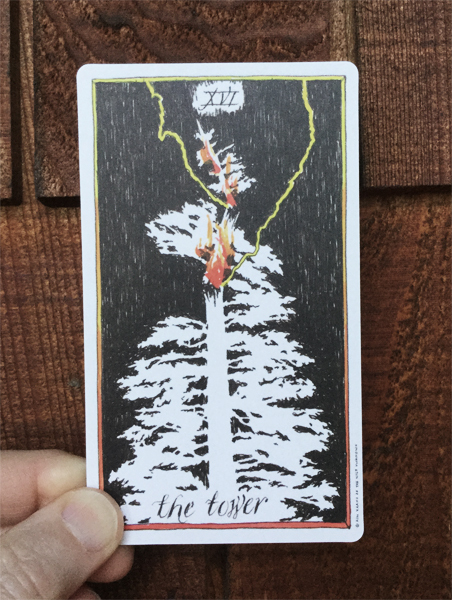 Well, if you're into tarot you know The Tower can set off quite a lot! At first I really didn't want to deal with this card, which is a signal to me that I am seeing a message I really need to see. This post is the first step on a road that I hope to continue through 2016. I have tried blogging before, but I never found a groove with it. I'm a rather obsessive blog reader, so I wonder why it's been so hard to find my own voice online? I post a lot on other people's blogs and Facebook. It's a copout, really, because I rarely have to go back and face what I've written. I also don't have a place where all my obsessions & infatuations are gathered in one big heap in front of me. Perfectionism is one of my big faults, and it's always been a huge hindrance to me creatively. I get started on something, but it isn't quite right, so I tweak and refine and polish and.... and then I get discouraged and abandon it altogether. I know I'm not unique in my experience here: every creative person probably struggles with perfectionism at some point. But for me perfectionism is coupled with a pretty generous heaping of self doubt and second-guessing and, oh gawd, low self-esteem. I'm also facing up to the realization that depression is a much bigger influence on my life than I have been willing to admit. I've always had times of low energy, low motivation, and the like—but this holiday season (we can always count on that!) really slammed me into a wall. I recognized that pretty big chunks of my life have been taken up by periods of depression, and I want that to stop, or at least get a little less so. But tackling depression means facing up to some things I haven't even identified as "things," and that scares the crap out of me. I've got some old wounds that I'd rather not pick at, but that's precisely what I need to do. But I don't plan on using this blog to mope and whine. I've got plans (dreams even!) and I have to work on this healing in order to have the energy for those things. But I know a lot of self-defenses and self-defeating habits need to come tumbling down, which is one thing the Tower speaks to. The Tower also refers to disasters and catastrophes—specifically Man's technology falling to the will of Mother Nature. We're seeing some of that in the world today, aren't we? It also happens that a great deal of my reading of the past three years has to do with the folly of our industrial civilization, and the fantasies we concoct to convince ourselves that we will get a handle on things, that "someone will figure something out." I had been planning on writing about this subject quite a bit, so I'm glad to see the Tower is showing me that it's really time to start doing so! If you've read this far, thank you. I have no desire for this to be merely a soapbox, so please do share and comment. I welcome all respectful and polite dialog. Be well, and may 2016 bring you insight and freedom from that which holds you back. The card pictured above is from the beautiful and haunting Wild Unknown Tarot by Kim Kranz. Thank you to my teacher Milla for bringing this deck into my life, and to Jaina Bee and South for helping me start on the path of Tarot. My previous blog was built on WordPress. I've been a WordPress gal for ten (!) years, but while the platform has developed into a fabulous tool for building websites, it had proven to be something of an impediment to an un-selfconscious approach to blogging. This time I'm working with Squarespace, and I really love the simplicity of it.